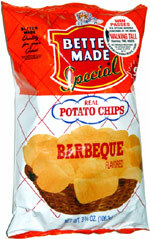 Taste test: These were some great-tasting barbecue chips. They were thinly cut and had a nice crispness to them, but the highlight was definitely the taste. There wasn't any heat in the flavor, and there was just a slight aftertaste. These chips had some major fans around the chip bowl.